"Adding a little orange juice to make the dressing a little sweeter. This recipe easily makes enough for 10 people or more. If it's on the thin side, add another 1/2 cup of mayonnaise. If it's too thick, thin with more orange juice." Stir mayonnaise, sour cream, sugar, white balsamic vinegar, orange juice, and pepper together in a bowl. Toss cabbage and carrots together in a large bowl. Drizzle dressing over the cabbage mixture and toss to coat. I used regular balsamic vinegar. But what the heck it was just the family and beige is a color that goes with everything. Awesome recipe!!! Thanks. Yummy! 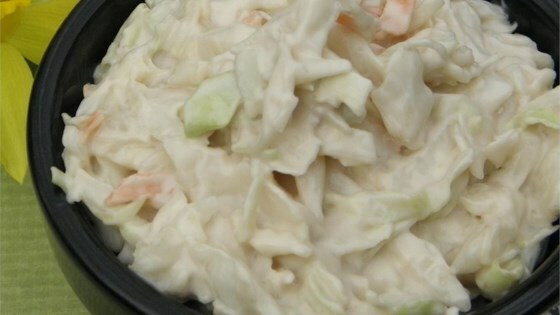 I'm not usually a coleslaw fan, but this one is a keeper! I agree with other reviewers . . . need a little more of the tasty sauce. Thanks for sharing! Oh family loved it! Thanks for the recipe. Excellent coleslaw. I used 1 head of cabbage & the consistency was just right. Yum-eee!